In 1940, 52-year-old composer Rosy Wertheim saw her new piano concerto performed in The Hague. That May, the Nazis invaded the Netherlands. In late 1941, the Nazi Kultuurkamer was established in the Netherlands. In order to work, artists, actors, authors, and musicians were forced to pledge written loyalty to the Nazis. Censorship would follow if deemed necessary. Wertheim subsequently withdrew from music entirely and escaped to the countryside, where she went into hiding. She was unsure if she’d ever emerge. She waited there for a chance to escape the silence. Lots of people have asked me for the text of the speech that I gave at the Save Our Symphony rally on Peavey Plaza outside the Symphony Ball on September 20. So here it is. Thanks to all who came and all who listened. It was a strange night, but a good night. I hope to write an entry describing the event in more detail soon. As I’m standing next to Orchestra Hall, I have to remember the first time I came here. It was ten summers ago. I was just about to turn fourteen. My violin idol James Ehnes was playing the Beethoven violin concerto with the Orchestra. The staff at Orchestra Hall was so kind and so accommodating, and after James’s performance, they let me go backstage to get his autograph. After that experience, I went back to my room on the twelfth floor of the Hyatt over there, and I threw myself on the bed, and I sobbed like I had never sobbed before. I sobbed because I did not know that such beauty was possible. My reason for being here tonight is simple: I want other thirteen-year-olds to be able to experience the same beauty of world-class symphonic music that I did. The fact that I’m talking to you today is proof positive that ANY music lover can make a difference. It does not matter if you are young. It does not matter if you are poor. It does not matter if you don’t have a degree from Juilliard. ANYONE can make their voices heard in this struggle. If you can’t contribute money, you can contribute ideas. Because God only knows we need some more of those. I hope the men and women attending the ball tonight – who have given so generously over the decades – recognize that we the broader community are willing to give generously as well, in whatever way we can. We will not be ignored. 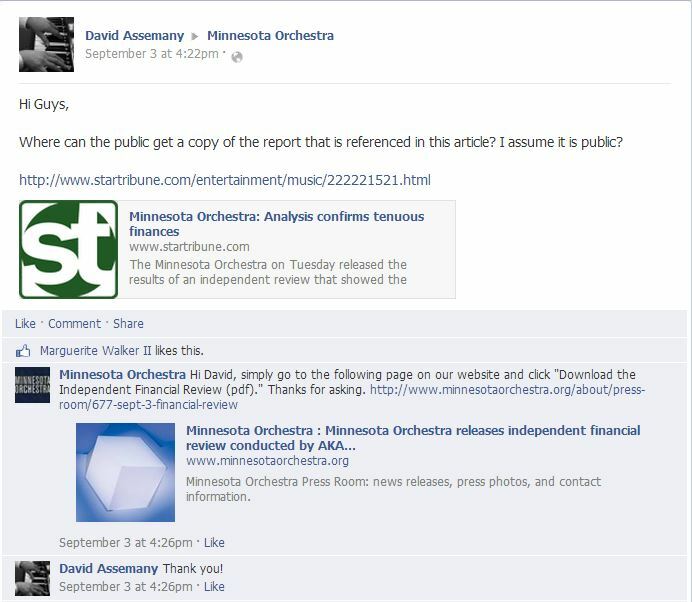 The Minnesota Orchestra will not thrive again until all voices are listened to. We are here to help. Let us help you. Talk with us. Despite this last year, I have faith in the future of orchestral music in Minneapolis. Our commitment to excellence runs deep. In fact, I believe it is our birthright. Will that commitment take hard work to sustain? Yes, it will. Are we up for it? You tell me. But as long as there is music, there is hope. I speak from experience when I say the impossible is possible. I mean, I’m on a speaker list with Tony Ross, the cello god. How much more impossible can you get? The musicians have committed to presenting a fall season of their own, and I thank them from the bottom of my heart for taking that leap of faith. I do not know where we will end up, but I do know that we will end up there together. I predict that our love of orchestral music will not die; in fact, I predict it will flourish. Love tested in battle is the strongest love of all. If we work together – all of us – we can keep the doors of some hall somewhere open, with some kind of great orchestra within. We have done so for 110 years, and with hard work, we will do so for another 110 more. Together, we will serve the next young teenager who comes to the hall to discover the beauty that only a great orchestra can provide. I was invited to speak at Save Our Symphony Minnesota’s rally “Ending the Lockout Will Be A Ball.” Details here. I mean it when I say it’s a tremendous honor to have been asked. I also mean it when I say it’s incredibly awkward to be asked to speak, when Michael Henson is going to be a few hundred feet away, not listening to any of us, and attempting to raise hundreds of thousands of dollars for a non-existent orchestra, and maybe coming up with a condescending soundbite to give to the press about us. We have indeed entered The Twilight Zone. This will be the weirdest Symphony Ball in human history. There will be no symphony. Michael Henson, Jon Campbell, and Richard Davis will be ensconced inside (obviously). There will be security personnel milling about to protect vulnerable donors from The Union. The tents have already sprung up in Peavey Plaza. Some of the wilder rumors circulating include suggestions that windows are being darkened and shrubbery is being rented to shield the people who are fundraising for the orchestra…from the orchestra. As I always say, what’s the use of a $50 million glass lobby if you can’t obscure it with shrubbery and dark window cling? Yeah, that’s right: there is no point. Anyway, SOSMN is having a rally to show support for the…I don’t even know what to call it at this point. I want to say “the orchestra”, but there’s this idea circulating that the musicians aren’t the orchestra, so… We’re there supporting the people who play great orchestral music in Minneapolis; let’s say that. There will be musicians there, friends there, families there. Some people will be dressed in gowns and tuxes. Others will be in sweaters and sweatshirts. It’s not going to be that structured…just a fun time milling about in downtown Minneapolis with some really fabulous first-rate music in all sorts of genres. We’re not out to vilify anybody. Just want to have a great time, chatting, dancing, singing, and listening. If our presence makes the board uncomfortable, then that’s not our problem, frankly. It’s about time they remember there’s an audience out there, because they sure haven’t listened to us so far! Here’s an approximate visual representation of how I’m thinking this party will go down. I can’t guarantee there will be scantily clad dancers, pyro, or an abominable snowman with Shake Weights, but other than that, I think it’ll be very similar! Well, I’ve slipped in my token Colbert reference for the week. Hope to see you Friday night in Minneapolis. I find myself thinking of prairie fires today. During each burn, non-native plants are removed, allowing prairie plants more nutrients and room to grow. Prairie plants can survive fires since they have deep roots and grow from a point underground. A prescribed burn is a crucial component in prairie restoration. I don’t need to waste breath elucidating how this metaphor ties into the Minnesota Orchestra lockout. If…sigh…when the lightening strikes, and the fire burns, this will be a horrible thing. There will be a lot of heat and a lot of sparks and a lot of smoke. Anything and anyone without deep roots is going to crumble to ashes. After it’s over, the prairie will be unrecognizable. I’ve just had the most fabulous conversation with the MOA on Facebook! When that wasn’t answered, I poked them a little more…but then thankfully David backed me up.